I just want you to know that Ramon and Jorge were excellent painters. I am very pleased with their work in the hallway, my daughter’s room and the bathroom. They were meticullous, tidy and unobtrusive. Looking forward to having them paint the kitchen and maid’s room, but still working out renovation plans for kitchen and color for latter. I can’t begin to find the words to describe how thankful Donna and I are for the amazing work the Mamais Crew did on our new bathroom. Everyone demonstrated their skills with pride, thoughtfulness, and courteous respect. We are so proud and honored to show off our new bathroom to all of our family and friends. I am very pleased to write this letter of reference for Mamais Construction. As the Principal of Krajewski Architect, a full service architectural firm in New York City (licenses in New York and New Jersey) I have worked with Mamais on various projects since 2011 and find them to be a reputable an reliable company capable of providing quality construction services. I have first hand knowledge of their ability to execute a well thought out and well crafted project. They conduct business in an honest and professional manner and pride themselves on quality and value. I recommend Mamais Construction without reservation. I hired Mamais Construction in 2013 to renovate my brownstone in New York City. The project included a complete gut renovation of all four floors; approximately 3,800 sf. Although this was a complex job and had a number of challenges – I always found them more than willing to go the extra mile to get the job done to my satisfaction. Their crew was professional, courteous and highly skilled. During construction their supervisors were always accessible and worked hands on with trade contractors to ensure a successful project. Despite the unforeseen issues that arose during construction, they maintained the schedule and kept the project within budget. 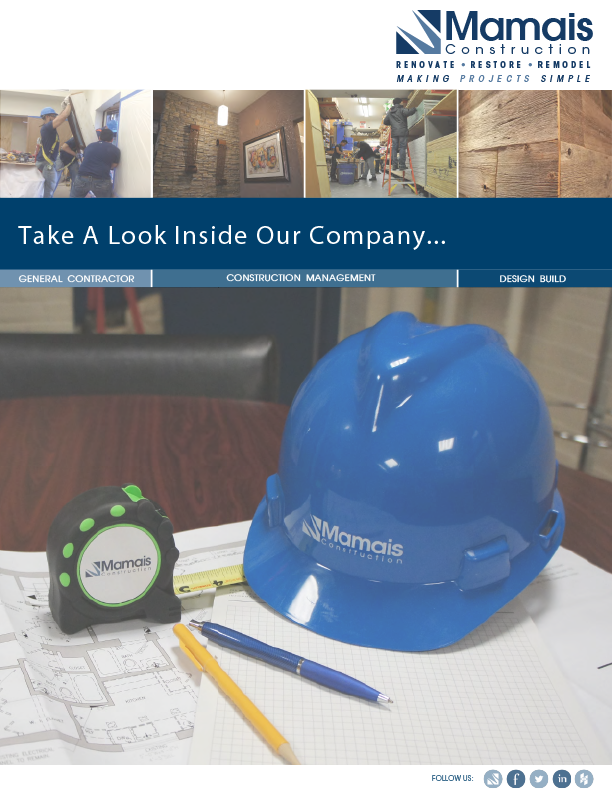 Based on my positive experience I would recommend Mamais Construction without hesitation for any professional construction services. It is with pleasure that I write this reference letter for Mamais Contracting Corporation as my department has benefit from their services for at least 13 years at Teachers College! I’ve been able to count on them for both small and large projects. We’ve utilized them for simple paint projects, kitchen renovations to full apartment renovations. Some of the details of the full renovations included bathroom tile work and tub reglazing, sanding and refinish floors, wall prep and painting, kitchen cabinet and appliances installs. They have also done amazing carpentry work by building very nice radiator covers. Their prices are competitive, and the work is great! I also would like to mention that they have always been able to come through for us on some last minute emergency situations which means a lot! I without hesitation encourage you to consider [Mamais Contracting Corp]! I would like to thank you for the excellent job you did on the construction of my new kitchen. Pauline swears that the food I cook tastes better! The quality of the work is superb, and it was done in a most courteous and timely manner. I was most impressed by the professionalism of Alli, Taco and the guys. It has been a pleasure working with you. We hope that we can get a quotation on our porch remodel as we discussed. We would like to start the work in the not-to-distant future, as we would like to have it finished by the summer. How’s it going? Just wanted to thank you and your men for the excellent job you did in my home. I know it took longer than planned and I am sorry if this caused any problems. Please tell your boss that he has a very capable and extremely nice crew. It is much appreciated and I think you should all get a substantial raise! I hope we will cross paths again – we will since my bathroom needs to be painted and the kitchen is getting new cabinets in the Fall, which I think you will be in charge of… In the meantime, be well and enjoy the Summer. My very best to you and special regards to Andreas who had to put up with me every day!